England was the birthplace of Neoclassicism in architecture, as it had been in the forefront of painting and sculpture. The earliest sign of this attitude was the Palladian revival in the 1720s, sponsored by the wealthy amateur Richard Boyle, Lord Burlington (1694-1753). Chiswick House (figs. 868 and 869), adapted from the Villa Rotonda (see figs. 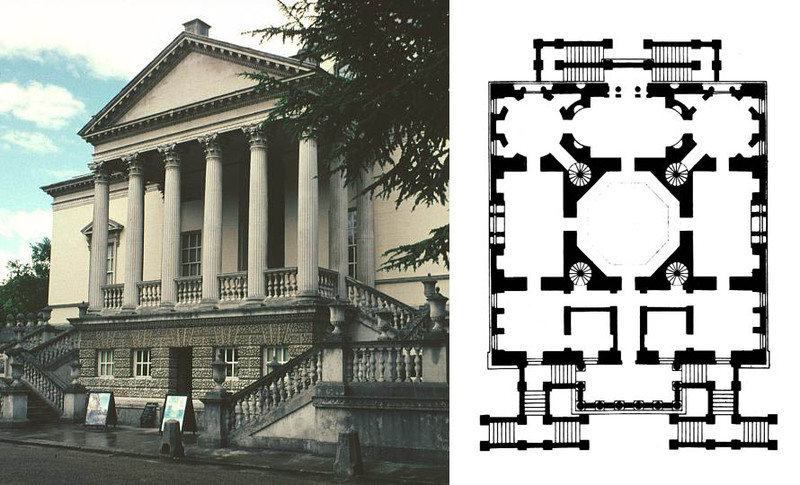 702 and 703), is compact, simple, and geometric� the antithesis of the Baroque pomp of Blenheim Palace (see fig. 828). What distinguishes this style from earlier classicisms is less its external appearance than its motivation. Instead of merely reasserting the superior authority of the ancients, it claimed to satisfy the demands of reason, and thus to be more "natural" than the Baroque, which at the time was identified with Tory policies by the Whig opposition, thus beginning an association between Neoclassicism and liberal politics that was to continue through the French Revolution. 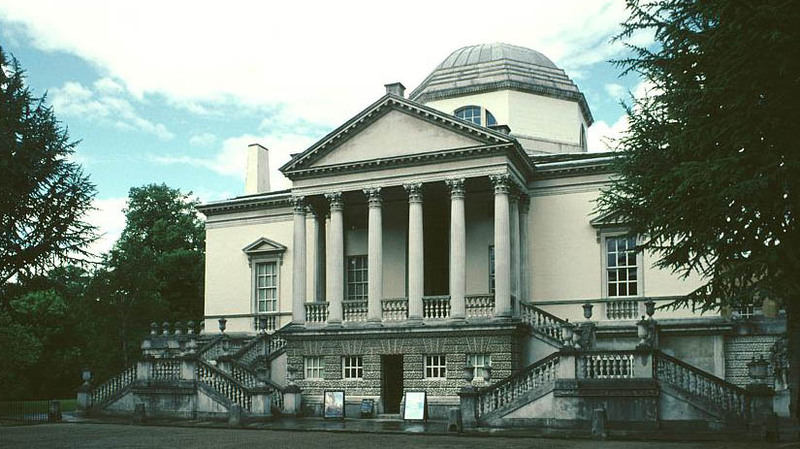 This rationalism helps to explain the abstract, segmented look of Chiswick House. The surfaces are flat and unbroken, the ornament is meager, and the temple portico juts out abruptly from the blocklike body of the structure. Richard Boyle, 3rd earl of Burlington, (born April 25, 1694, London, Eng.�died Dec. 4, 1753, London), English architect who was one of the originators of the English Palladian (Neo-Palladian) style of the 18th century. Burlington was born into an enormously wealthy aristocratic family. From a young age he was a patron of the arts, interested in the visual arts, music, and literature; the composer George Frideric Handel and the poet John Gay both stayed in his home, and he was a patron of the poet Alexander Pope. A journey to Italy persuaded him that admirable architecture, grounded in the restraint of Classical models, would be essential to the promotion of good taste and decorum in Britain. He studied the works of Andrea Palladio and Inigo Jones and began practice upon returning to London from Vicenza, Italy, in 1719. He advocated a revival of Palladio�s and Jones�s interpretation of Classical tenets and assembled a collection, the largest to that time, of their drawings (now in the British Architectural Library in London), from which most of his own buildings are derived. He also commissioned numerous illustrations of Palladio�s building. About 1721 Burlington designed Great (now Old) Burlington Street, No. 29. In 1725 he designed his villa at Chiswick (now in the outer London borough of Hounslow), one of the most influential Palladian buildings in England (completed 1729). The Assembly Rooms at York with the Egyptian Hall (1731�36) are considered the culmination of Burlington�s career. Burlington�s practice of architecture drew criticism from contemporaries; aristocrats of the time did not themselves work in the arts. Yet his money and position enabled him to influence taste and to ensure through his political connections that architects who pursued the Palladian ideals (with the help of Burlington�s collections) were able to design important buildings throughout Great Britain and to contribute to the orderly development of the expanding cities. Burlington�s work was�in its reliance on earlier models, its rationality, and its restraint�a precursor of later 18th-century Neoclassicism. William Kent, (born c. 1685, Bridlington, Yorkshire, Eng.�died April 12, 1748, London), English architect, interior designer, landscape gardener, and painter, a principal master of the Palladian architectural style in England and pioneer in the creation of the �informal� English garden. Kent was said to have been apprenticed to a coach painter at Hull. Local patrons, impressed by his talent, sent him to study painting in Rome from 1709 to 1719. There he studied under Benedetto Luti. In Rome he also met the Earl of Burlington, the foremost architectural patron of the 18th century in England and the principal promoter of Andrea Palladio�s classical building style (Palladianism). He took Kent back to London in 1719 to decorate Burlington House in Piccadilly, where Kent then lived for the rest of his life. The association with Burlington had a determining effect on Kent�s rather severe architectural style, which was characterized by well-proportioned masses arranged in simple relationships. Although later Neoclassical architects, such as Robert Adam, were to criticize Kent�s works as �immeasurably ponderous,� his influence on them was considerable. Kent was also familiar with the style of Inigo Jones, whose Designs (published 1727) Kent edited. By the 1730s Kent had become a fashionable architect. Among his principal buildings is Holkham Hall, Norfolk (begun 1734). Here, as in other works, Kent designed interiors and even furniture, becoming one of the earliest English architects to plan a house in one unified design scheme. Kent�s best known works came out of his appointment, through Burlington�s influence, as a master carpenter in the Office of Works (1725). The Royal Mews (1732), the treasury buildings, Whitehall (1734�36), and the Horse Guards Building in Whitehall (1750�58; completed after Kent�s death) are all part of Burlington�s grand intention of rectifying the sorry state of England�s architecture by adhering more closely to classical precedent. The rather theatrical interiors of some of these structures, as of the masterful No. 44 Berkeley Square (1742�44), and Kent�s taste for fanciful Gothic style in furniture designs suggest that he wore his Palladianism lightly and that, in the absence of Burlington�s overpowering influence, Kent might as easily have become a master of the Baroque. It was in his gardens�conceived of as natural landscapes to contrast with the classical severity of his buildings�that Kent may have achieved his freest expression. He created gardens at Rousham Hall, Oxfordshire (1738�41), and Stowe House, Buckinghamshire (c. 1730), where winding paths and open vistas lead to small classical temples in informal wooded glades. In describing the revolt from formality in garden design, Horace Walpole wrote that Kent saw that �all Nature was a garden.� The informal and irregular landscaping at these sites and others, such as Pope�s Villa, Twickenham, Middlesex (for Alexander Pope; c. 1730), and Richmond Gardens, Surrey, were a marked departure from the manicured, symmetrical precision of French gardens such as those at Versailles. The English style soon crossed the Channel and had a substantial impact in France during the second half of the 18th century. Should such a villa be set in a geometric, formal garden, like Le Notre's at Versailles (see fig. 815)? Indeed not. Lord Burlington and his circle maintained. That would be unnatural, hence contrary to reason, so they invented what became known all over Europe as "the English landscape garden." Carefully planned to look unplanned, with winding paths, irregularly spaced clumps of trees, and little lakes and rivers instead of symmetrical basins and canals, the "reasonable" garden must seem as unbounded, as full of surprise and variety, as nature itself. It must, in a word, be "picturesque," like the landscapes of Claude Lorraine (fig. 811), which English landscape architects now took as their source of inspiration. A standard feature was the inclusion of little temples half concealed by the shrubbery, or artificial ruins, "to draw sorrowful reflections from the soul." Such sentiments were not new. They had often been expressed before in poetry and painting. But to project them onto nature itself, through planned irregularity, was a new idea. The landscape garden, a work of art intended not to look like a work of art, blurred the long-established demarcation between artifice and reality, and thus set an important precedent for the revival styles to come. After all, the landscape garden stands in the same relation to nature as a synthetic ruin to an authentic one, or a Neoclassic or Neo-Gothic building to its ancient or medieval model. When the fashion spread to the other side of the Channel, it was welcomed not only as a new way to lay out gardens but as a vehicle of Romantic emotion. 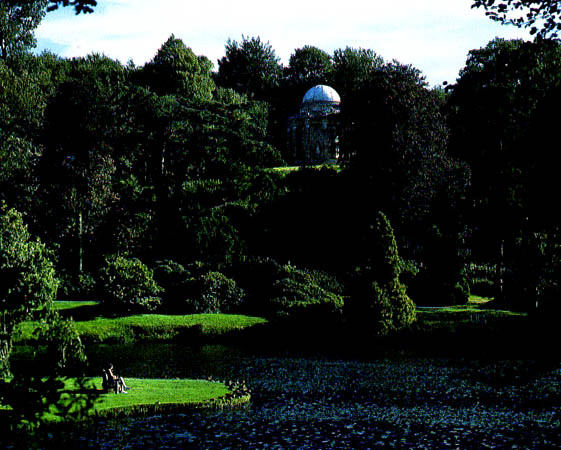 Of all the landscape gardens laid out in England in the mid-eighteenth century, the one at Stourhead most nearly retains its original appearance. Its creators, the banker Henry Hoare and the designer Henry Flitcroft (1697-1769), were both enthusiastic followers of Lord Burlington and William Kent. Stourhead is unique not only for its fine preservation but also for the owner's active role in planning every detail of its development. Our view (fig. 870) is across a small lake made by damming the river Stour. High on the far shore is the Temple of Apollo modeled on the Temple of Venus at Baalbek (see fig. 262), which became known in the West only after 1757. Occupying other local points at Stourhead are a grotto, a Temple of Venus, a Pantheon, a genuine Gothic cross, and a neo-medieval tower built to commemorate King Alfred the (Treat, the "Father of His People." 870. HENRY FLITCROFT and HENRY HOARE. The rationalist movement came somewhat later in France. 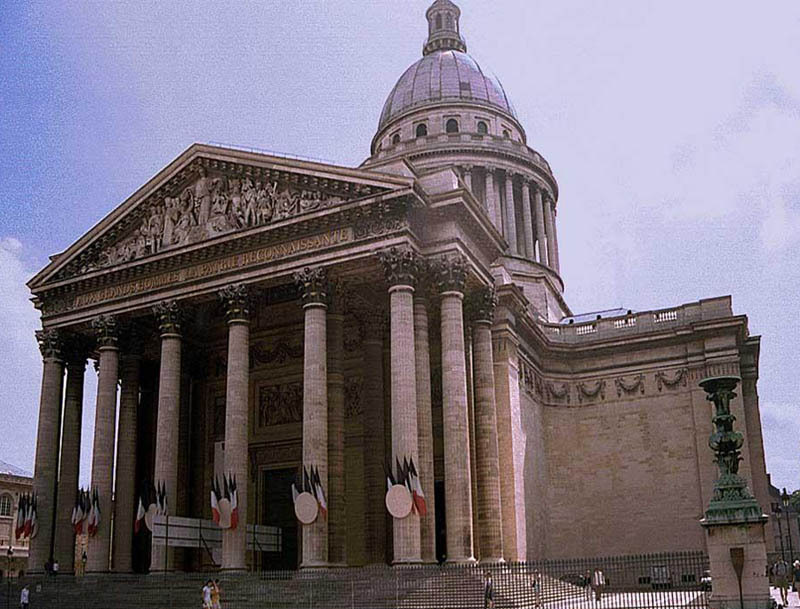 Its first great monument, the Pantheon in Paris (fig. 871), by Jacques-Germain Soufflot (1713-1780), was built as the church of Ste.-Genevieve, but secularized during the Revolution. As with so much else in eighteenth-century France, the building looks back to the preceding century, in this case Hardouin-Mansart's Church of the Invalides (fig. 819). Its dome, interestingly enough, is derived from St. Paul's Cathedral in London (see fig. 825), indicating England's new importance tor Continental architects. The smooth, sparsely decorated surfaces are abstractly severe, akin to those of Chiswick House (an effect further emphasized by later walling in the windows), while the huge portico is modeled directly on ancient Roman temples. From this coolly precise exterior we would never suspect that Soufflot also had a strong interest in Gothic churches. He admired them, not for the seeming miracles they perform but for their structural elegance�a rationalist version of Guarini's point of view (see fig. 764). His ideal, in fact, was "to combine the classic orders with the lightness so admirably displayed by certain Gothic buildings." Soufflot, however, did not study Gothic architecture in detail, as later generations of architects would. 871. JACQUES-GERMAIN SOUFFLOT. The Pantheon. 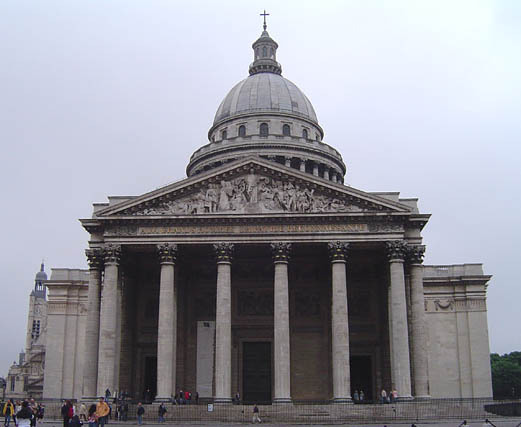 Jacques-Germain Soufflot, (born July 22, 1713, Irancy, France�died Aug. 29, 1780, Paris), French architect, a leader in the development of Neoclassical architecture and the designer of the Church of Sainte-Geneviève (the Panthéon) in Paris. Claiming to be self-taught, Soufflot made several sojourns in Rome during the 1730s and �50s and studied the classical monuments there as well as the Greek temples at Paestum. 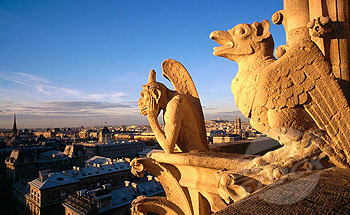 In 1738 he returned to Lyon to practice as an architect. The simplicity, spaciousness, and archaeologically accurate classical details of the principal works of his Lyon period, the extension of the Hôtel-Dieu (begun 1741) and the Loge des Changes (1751�52), presaged the movement of French taste away from the Rococo and toward Neoclassicism. Soufflot was entrusted in 1755 with the design of Sainte-Geneviève, which was intended to be the principal church of Paris. His aim in this project was to combine the strict regularity and monumentality of Roman arched ceiling vaults with the lightness of slender supporting piers and freestanding Corinthian columns. A contemporary architect claimed that in this church, Soufflot had �united the lightness of construction of Gothic churches with the purity and magnificence of Greek architecture.� The plan was essentially a Greek cross, the facade an enormous temple front. The freestanding columns proved inadequate to support the building�s dome, which eventually had to be buttressed. Because of the predominantly classical origins of the design, it became a simple matter, when the Revolution abolished religion, for the church to be secularized and renamed the Panthéon. Unfortunately, the side windows were at that time walled up and much decoration removed. The effect of a light interior space was destroyed, resulting in the somewhat gloomy monument that the Panthéon is today.